April 2012, this month is all about Easter this year – the great spring celebration. Sometimes we get snow around Easter in the Alps – but still Easter is a holiday to celebrate as much as possible outside. The perfect Easter Day is when the big Easter egg hunt can take place outside. If we are really lucky even the Easter Sunday afternoon coffee can be enjoyed al fresco. For the Easter time pastel colours and strong colours, especially greens is what we long for, we like them to be accompanied by yellow, orange, light blue and pink. Spring Colours on the Easter table, a good starter are colourful Easter eggs. The Easter DIY craft sets by MiaDeRoca are of course as well in Spring colours. Be it the felted carrot wrapper in yellow and light green or orange and meadow green or the bunny case for iPhones and Smartphones. The carrot case would be the perfect gift wrapper and the rabbit smartphone cover and exceptional Easter bunny gift. By the way the carrot gift wrap keeps your gifts perfectly save in unpredictable April Easter weather – if cold and snow prevails it will keep Easter gifts save and warm and even protect them from humidity, when it is a hot day and the sun on Easter Sunday casts its rays through leafless bushes, it will protect the chocolate Easter bunny from instantly melting. In preparation of the Easter time we added several new recipes and some crafting inspiration in March. A recipe, several have asked for, has been already written up back in February. This recipe is perfect for Spring, and will make a lovely dish, even during lent: wild garlic pesto. Wild Garlic pesto and many other home made pestos are great hostess gifts or little presents for many other occasions. You can add special value to this gifts, when you decorate them nicely. Some inspirations on how to decorate food gifts are collected over here: decorating jam jars. This year wild garlic season comes very late to the Alps. Some regions in the South Tyrol, Northern Italy, Slovenia and the East of France are luckier as their milder winters lets nature recover earlier and you can find wild garlic at the end of February. Especially of wild garlic fans and wild garlic pesto connoisseurs we have designed wild garlic pesto tags – which are available to download. These pretty tags can be printed out and used to glue to the wild garlic pesto jar or bind it to the pesto lid – how great this looks can be seen on our photo for the April calendar sheet. Speaking of crafts, that is not all concerning March, this year we show you some sweet Easter cards. These cards can be used as invitation for Easter brunch or sweet Easter greeting cards. When you use these cards as invitation for Easter celebration you can set the decoration theme for your Easter table. 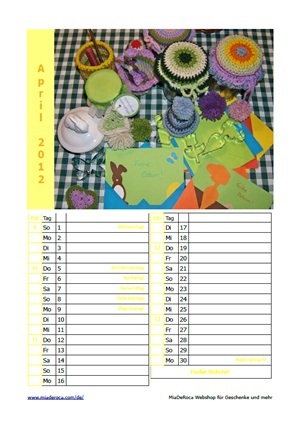 The picture of our April calendar allows a first glance at the crafting idea. Soon we will give you the DIY tutorial. In the meantime have a look at our other Easter crafting inspirations. Find free printable calendar sheets monthly at MiaDeRoca - to not miss one calendar, click "like" on our facebook page, or subscribe to the RSS-feed of this site.